Typically used for boundary marking and signage on motorways and pedestrian areas where a permanent colour finish is needed, Marshalls’ marker blocks will enhance the overall effect of any contemporary paving scheme. Available in a range of colour options, the products create slip-resistant and durable surfaces that will stand up to any urban planning challenge. Part of our Keyblok range, these block paving marker blocks deliver high visibility, making them ideal for bold markings and delineation across a number of applications. 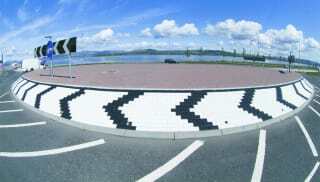 For example, glass bead coated White Reflective Keyblok provides excellent reflective qualities for traffic-calming solutions in busy areas. While ideal for use in most urban layouts, for those projects seeking an alternative finish, other concrete marker blocks can be supplied coated to order. Take a look through the full range now.